sacrifice, Davis then unwittingly turned his wonderful wife into a nerd-girl. prematurely white (it sure sounds prettier than the dirty gray it actually is). practices medicine, but only when the insurance companies tell him he can. Ready for a rollicking adventure filled with magic and danger? Look no further than William Wilde and the Necrosed by Davis Ashura. The story opens with a tragic car crash involving a family of four. Only one boy will emerge from the wreckage. Sadly, however, this is not a “normal” accident. It has been brought about by a strange being named Kohl Obsidian. Who or what Kohl is remains to be seen, but one thing is for certain: he’s evil and he is not human. Fast forward several months and we meet high school senior William Wilde and his cadre of best friends: Jason, Daniel and Lien. It’s the first day of school and William is tasked with orienting a new student, the lovely Serena Paradiso, to life at St. Francis Academy. The beautiful new student seems to fit into their group with surprising ease, but Serena has secrets of her own and an important mission to fulfill. When William learns there is a hidden group of people called asrasins for whom magic is real, he is both skeptical and excited, but when he’s told he has the potential to become an asrasin himself his world is rocked! William, Serena and Jason must fight for their lives against the brutal and seemingly invincible Kohl Obsidian while simultaneously making decisions about their futures. With secrets still rampant amongst the friends, can they somehow manage to band together and defeat Kohl’s evil or will the secrets be their undoing? 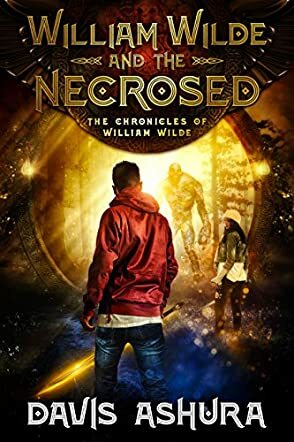 Aside from the sinister prologue chapter, William Wilde and the Necrosed starts out in familiar young adult territory as we watch William navigate the oft-treacherous pathways of high school life. Contending with bullies, boring teachers, school sports, and weekends with his friends, the first half of the book feels safe and familiar. Set in the late 1980s, some of the pop culture references might be lost on younger readers, but the book manages to maintain a timeless feel. Despite the familiarity, Davis Ashura continues to plant little seeds of disquiet throughout, leaving the reader on edge and waiting for the other shoe to drop. And when it does drop? Hold onto your hat! The adventure goes from zero to sixty in record time and holds on tight until the story’s satisfying conclusion. Filled with new lore and mythology, daring escapes, magic and heart-racing action, William Wilde and the Necrosed sets the stage for a wonderful series. Adults (young and otherwise) are sure to be entertained. In William Wilde and the Necrosed by Davis Ashura, as William begins his senior year of high school, a beautiful new girl comes to town. Surprised that she seems interested in him, William includes Serena in his close circle of friends as he deals with bullies and an even more important issue in his life – the fact that he seems to have some type of magical power. The awakening of his power brings the monster responsible for the deaths of his parents and his brother eight months earlier out of hiding because it now wants to feed on William’s magical blood. To get away, William, Serena and Jason leave Ohio and head west, joining a circus for the protection offered by the people and animals. Once they head to a special magical site in Arizona, though, they are targets for the Necrosed. Will they make it to the secret bridge to a magical land in time or will the monster who has never been defeated win? Magic is real, and it is not all fun and games in William Wilde and the Necrosed by Davis Ashura. Exciting, scary and fun with deep secrets and amazing surprises, William Wilde and the Necrosed by Davis Ashura captures the struggles of many 17- year-old guys as they find their way through school, the idea of girlfriends, and the emotional upheaval of personal tragedy and loss. Well written with realistic dialogue and interactions, as well as some appropriate lessons about life, this is an intense story that holds your interest and keeps you turning the pages to see what is going to happen next. William Wilde and the Necrosed by Davis Ashura is the first novel in this series about William Wilde, who learns that his dream of magic being real is coming true. However, it's not quite the way he'd like it to be. His problems started when his parents and his brother were burned to ashes in a car accident about a year ago. He moved in with Jason and Mr Zeus. In the new school year, he meets a beautiful girl, and to everyone's surprise, she takes a liking to William, a well-known and often bullied nerd. William usually hangs out with his group of nerdy friends, but Serena soon becomes part of the group. What William does not know yet is that each of his friends, including Serena, hides something from him. But when a dark being called Necrosed appears, the truths start to come out. William seems to be more than he thought he is. And magic seems to be real. But what do his friends and Mr Zeus know about all this? And which secret is Serena hiding? If you like magical young adult stories set in our world, then William Wilde and the Necrosed by Davis Ashura is definitely worth a try. It's one of those books that immediately draw you in, and it's hard to put it down. It took me only three evenings to get through the book (and it's not particularly short). I liked that the era in which the story took place was in the late '80s - and there were many nods at classics like Dungeons and Dragons. It was fun to read these passages as they also created a little bit of nostalgia. The main draw, however, was the well thought through plot and the likable characters. Everyone has their own story, and you get to know the characters bit by bit (however, not with an information dump in the first chapter like so many authors tend to do). While the main plot can be explained in a few minutes, a lot is happening along the way. There is an interlude in a circus and then a speaking kitten turns up! It sounds like some characters play a role in the author's other novels, so I'll have a look because I enjoyed reading this one a lot. I also liked the design of the book, each chapter having a nice little illustration followed by a proper chapter title. It's nice to see authors who put some effort into what their written content looks like. It adds that little extra enjoyment for readers. The story makes you believe in magic again, or it rekindles your hope that somewhere, somehow, magic truly does exist. And in a way, a good novel is a bit like magic because it allows you to travel to different places, read other people's minds, and escape your own worries for a few hours! On the face of things, William Wilde is a humble, albeit somewhat nerdy high school student with a good heart, despite the recent tragic loss of his family. With the help of his extended family of friends, he is trying to navigate his final year of school as he copes with his grief. There are bullies to deal with, frightening cafeteria food, and boring teachers. But when a beautiful girl comes into his life, things start to look up. And he has no idea that in the not too distant future, everything he knows about his friends, family, and life will not just come into question, but completely turn on its head. Although I don’t read YA or horror very often, I found William Wilde and the Necrosed by Davis Ashura to be a fun and engaging read. The main character, William, is an endearing hero who you want to root for and you do. His best friend, Jason, and his guardian, Mr. Zeus, are people you’d love to have over to dinner. And Serena, the beautiful new girl next door, remains a mystery throughout. The story does start off a bit slowly, introducing you to a cast of interesting misfits, nerds, bullies and well meaning adults – but then bam, slaps you in the face at the beginning of the second act. From there is a a non-stop ride of adventure, danger, revelations and, best of all, magic. If you are looking for a fun, engaging adventure that will surprise you and keep you guessing, you will enjoy this book. When seventeen-year-old William Wilde’s mother, father and brother are killed in a car accident, with William as the sole survivor, his life changes forever, but in ways he could never possibly have foreseen. The accident was, in fact, no accident; it was orchestrated by an evil zombie-like creature known as a Necrosed. In William Wilde and the Necrosed by Davis Ashura, William must not only cope with the death of his family, but as time goes on he becomes aware that this evil Necrosed, Kohl Obsidian, is actually after him for something he wasn’t even aware he possessed. William and his friends from high school are all your typical, quintessential nerds and, along with the beautiful and mysterious Serena, who is also much more than she seems, embark on an expedition to kill the Necrosed and to introduce William to his true identity and his true heritage. William Wilde and the Necrosed is a fantastic coming-of-age novel, with a massive dollop of fantasy and fun thrown in. With Davis Ashura setting the novel in the mid-1980s and having the main characters as nerds, it was inevitable that many of the iconic movies, songs and heroes of the period would find their way into this story. If anything, that served to give the story more character and depth than would have otherwise been the case. The main character of William Wilde was beautifully drawn as the sensitive, caring, yet geeky high school senior, who slowly but surely discovers his true self, his strength, and his true destiny. The close and caring friendships and inter-friend banter were certainly a highlight of the story for me. Don’t lose sight of the fact, though, that this is also a fantasy adventure story that absolutely rollicks along at a fantastic and, at times, dizzying speed. The fight scenes in the book were carefully orchestrated and choreographed. Ashura’s knowledge and clever writing certainly made these scenes a highlight of the story. An excellent read and I look forward to the second book in this series.